The Frontier Culture Museum is Virginia’s very own time machine, taking its visitors to 17th, 18th, and 19th Century Germany, England, Africa, Ireland and America. 1600s England- England’s first North American colony began with the founding of Jamestown in 1607. Discover the culture of the colonies, which grew at the hands of both white indentured servants and African slaves. 1700s Native American- See how an American Indian tribe may have lived just west of the Blue Ridge Mountains in the 1730s. 1700s West Africa- Explore the culture of 18th century West Africa, from which close to 250,000 individuals were brought as slaves, servants, and artisans. 1700s Ireland- Beginning in 1718, thousands of Irish Protestants migrated from their home in Ulster to the United States. Now you can catch a glimpse of the homes they left behind. 1700s Germany- Did you know that “Germans were the largest group of non-English speaking Europeans to settle in colonial America”? America- Various exhibits showcase the daily lives of citizens in the 1740s, 1820s, and 1850s in America. Don’t miss this historic opportunity to take a peek at the past. From the first moment you set foot on museum grounds, you’ll feel as though you’ve been transported back in time, where history comes to life before your eyes. Daily exhibitions aren't the only offering from the Frontier Culture Museum. 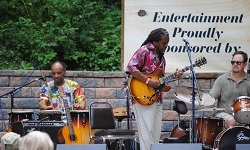 You'll also find a variety of events throughout the year—May Day, The Shenandoah Wine & Jazz Festival, The Blues and Brews Festival, Oktoberfest, and Lantern Tours, just to name a few. See the full calendar of events on the museum website. Have you frequented this business?